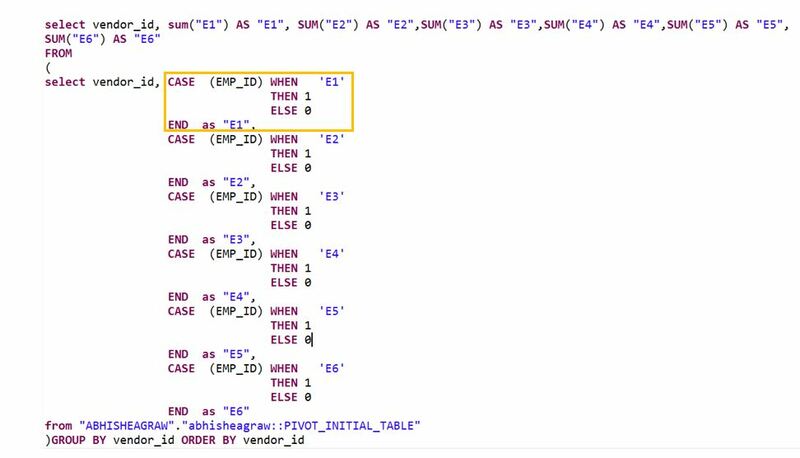 In my previous blog I have covered how to UNPIVOT data in HANA, in this blog I am covering how to PIVOT data in HANA. Base Table: This is a PO header table which has Employee ID, Vendor ID and PO Number. 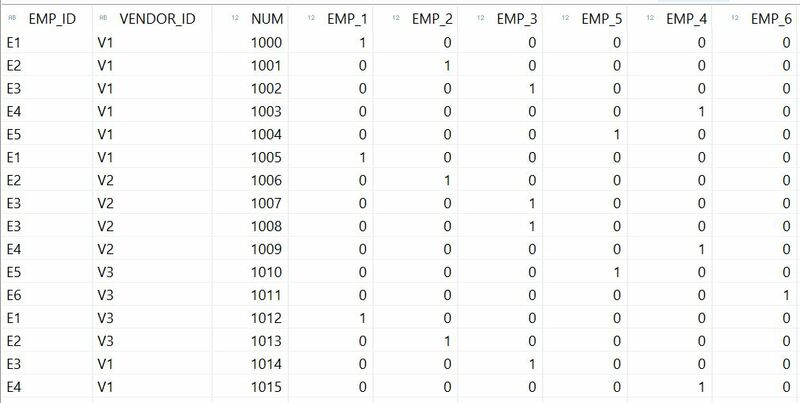 Since there are 6 different employees in base table hence we need to create 6 calculated fields, one corresponding to each employee and these fields will become our pivot column header. 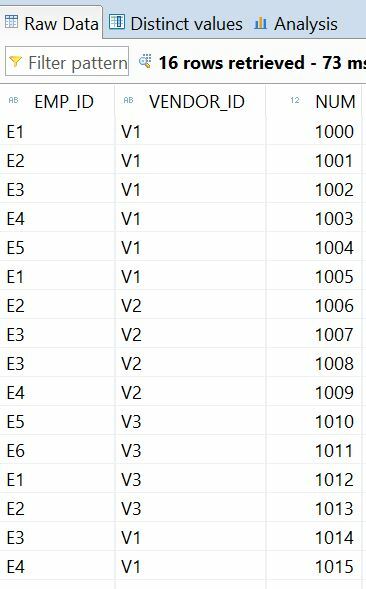 As per above expression, if employee is “E1” then make E1 (new calculated field) = 1 else E1 = 0. Write same expression for all the other fields and change Emp_ID value to E2, E3.., etc. Note: You need to create calculated fields in Projection node and not on Aggregation node otherwise aggregation on calculated fields will not happen. In above use case we used Count as aggregation function however if you want to use Sum or Max as aggregated function then you just need to make small change in your calculated field formula and aggregation function in semantic node. Changes for Sum: Lets say you want to check Sum of all POs placed by an employee, I know logically it does not make sense but I think you won’t mind if I take it as an example. Make above change for all the calculated fields. What happens if a new employee is added to the list ? Then we have to restructure the CV and rewrite the script as well, right ? You have got my “like”. 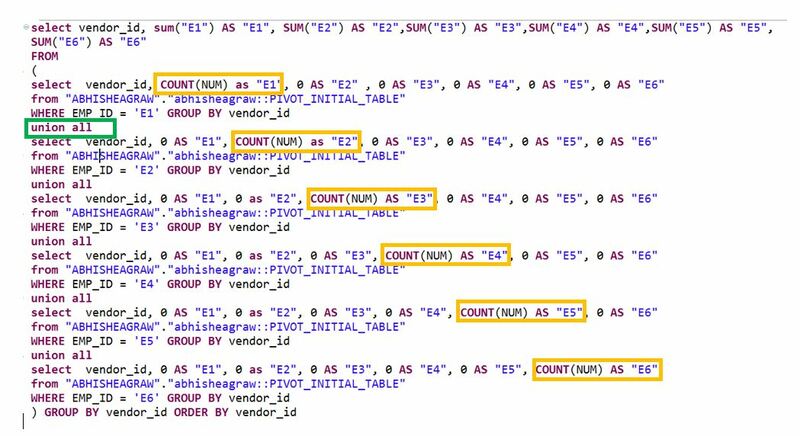 Unfortunately yes, we need to remodel and re-write the script and as far as I know even with PIVOT statement which is available in MS-SQL we need to add these PIVOT fields manually. To put it simple, there can be multiple vendors for same employee having different numbers. I need to change it to the column format based on the vendors and add as additional record for the same vendor but with different Number. Can you please paste the expected output? I have multiple information in the row format and would like to split it to column format. Can I use the logic that you have explained for this case as well or do you see some challenges implementing? Sorry for delay in response, unfortunately above solution will not work for you, if you try above solution as is you will get output like this which is different from desired o/p. Let me work on this and will get back to you with solution. I am also looking for a more performant and elegant approach. However the example shown above also solves the problem. Is it possible to Transpose Rows to columns, where as the columns might be dynamic. The Col2 values might increase dynamically. 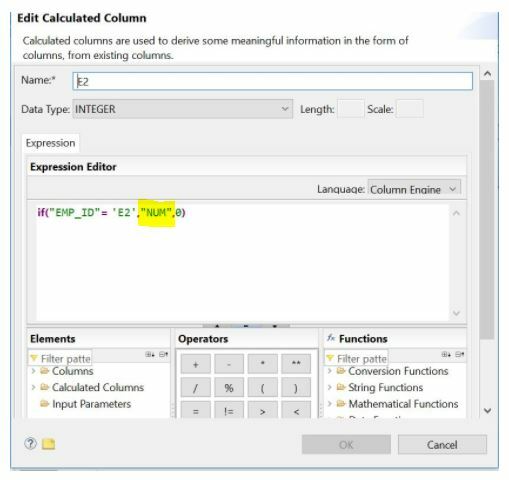 Unfortunately dynamic creation of column is not possible with this approach, we have same limitation in SLQ PIVOT statement as well, columns need to be defined during design time.